After 15 days of painting my nails I woke up today out of ideas and lacking inspiration. But as I was applying my makeup and using the new-ish L'Oreal Super Slim eyeliner I had a bit of a light bulb moment of using the liner for a bit of nail art as the nib is quite precise. I decided to go for bows and polka dots for ease and trust me this is easy! The bows can be done with either a nail art pen or an eyeliner pen (easier to use) and the dots can be achieved with the end of a bobby pin/hair grip and some black nail polish or a dotting tool/nail art pen. 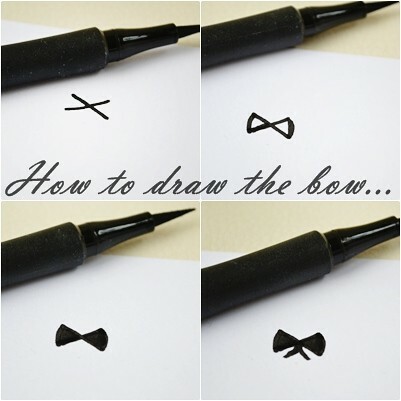 But if you still don't believe me about the bows then scroll down to see how to draw the bows in 4 easy steps. For the base nail polish I applied two coats of Models Own Champagne (£5.00 - ASOS) which I hadn't used in so long (Topshop & Max Factor do similar shades). Next it's on to the bows which as you can see below are pretty easy to draw on. After drawing on all five bows and the liner hadn't fully dried (you have to be quick though) I placed on the little Nail diamonds which are from Stargazer (£2.50 - Stargazer site). If you are too slow you could apply a clear top coat once you had finished your nails and place the diamonds on then as of course the top coat makes them stick properly. But of course this is optional and can be totally skipped! I then added the polka dot with the Models Own/Wah Nail Art Pen which I rate and I don't rate at the same time - the tip/dotting tool is great and does the job (this is what I used for the dots) but the brush inside to achieve lines and different shapes etc is just SO rubbish. I think I have had around 4 of these pens now and all the brushes have fallen out. After the dots it is important to leave them to full dry and then you can apply a clear top coat as you do not want the bows to wash off! They really are that easy! But it you do feel like you struggle with anything nail art related then it is worth practising drawing the bows and getting the dots the right size on a sheet of paper before you start. It is surprising how much it helps actually! On a bit of a side note but still very much nail art related, the founder of WAH nails - Sharmadean Reid has wrote her very own nail art book - The WAH Nails Book of Nail Art: Fashion at your Fingertips which includes 25 nail art tutorials! The book is out 1st April 2012 for only £6.79 on Amazon (here - also you can look inside the book) so I have pre-ordered the book for a little giveaway to mark the end of my nail challenge at the end of the month! I am officially half way through my 30 Day of Nails challenge now and I really do feel like I need to thank you all for the wonderful comments and tweets I have received. It has been so so lovely and I am so pleased people are enjoying it!